ComScore MMX Multi-Platform has reported that Times Internet's properties were the widest reaching and most engaged news / information properties in India in April 2017, across devices. The Comscore report indicated that Times of India sites alone reached over 69 million viewer (39 per cent of all news viewers), who spent over 7 billion minutes (51 per cent of top 14 sites' timespent) on Times Internet properties. The next most engaged publisher, Dainik Bhaskar Group, had 1 billion minutes of total usage. The ComScore report indicated that 84 per cent of India's total digital population access news and information sites in April 2017. 13 per cent of News/Information visitors/viewers accessed the content from both desktop and mobile platforms, while 79 per cent accessed exclusively via mobile devices. The ComScore report also indicates that the news / information category reached 92% of all 25-34 year olds and 89 per cent of all 15-24 year olds, higher age-demographic penetration than all other age groups. ComScore reports are heavily relied on by media buyers to assess reach and frequency of usage of different digital properties. 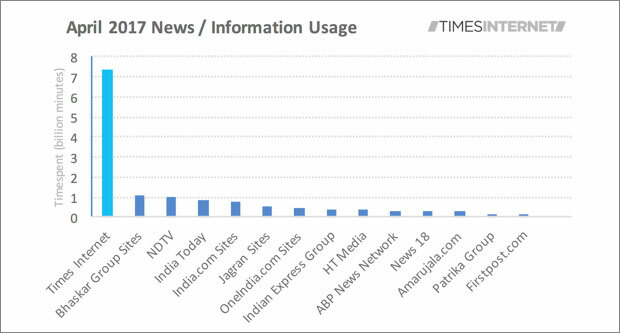 The Comscore report covered Times Internet's properties in the news / information segment. In addition, Times Internet operates dominant digital businesses in music, sports, lifestyle, real estate, personal finance, and more, which collectively reached over 250 million consumers in April 2017, making it the largest reaching Indian digital media group.